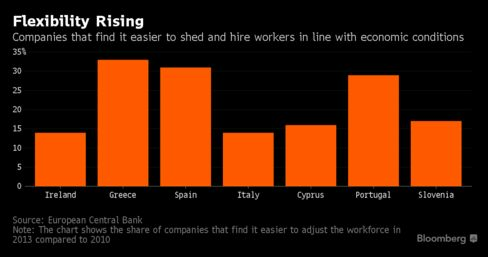 European Central Bank researchers have some welcome news for euro-area job seekers: Okun is back. A drop in unemployment from a record high of 12.1 percent in early 2013 to 10.1 percent in April this year was faster than economists and policy makers anticipated, and the link between gross domestic product and employment seems now to be as strong as it was before 2008. Previous research had shown that relationship — known as Okun’s Law after the economist Arthur Okun who proposed it in 1962 — weakened during the financial crisis. The study, published Wednesday for the ECB’s Economic Bulletin, suggests that societal change and structural reforms have made the job market more flexible and dynamic. That bodes well for the region’s economic prospects as a labor-market recovery is crucial for the strength of confidence and consumption in the aftermath of the crisis. Euro-area countries such as Spain and Greece that accepted bailouts have pushed through painful reforms in past years as a condition of those aid programs. That has made it easier for companies to adjust the size of the labor force in response to changing economic conditions. 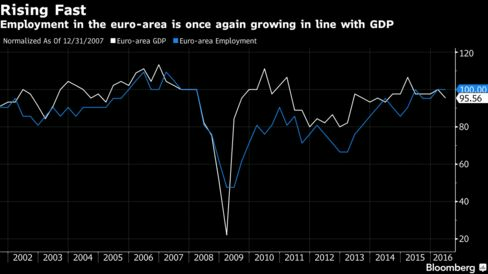 That conclusion gives ammunition to the ECB, which has stepped up the urgency of its calls for countries to push through structural adjustments to boost growth. The central bank this year created a a task force of national central bank staff to consider economic reforms, according to people familiar with the matter, who asked not to be identified because the initiative hasn’t been publicly announced. Longer-term economic factors are also at play. The shift to the services sector — which created almost all of the 3.2 million jobs the region has added since the recovery — is a boon as service companies tend to employ more workers than do manufacturers. 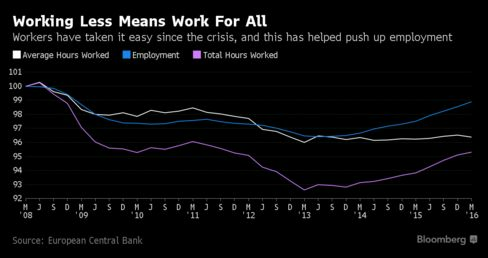 People are also working fewer hours: one third of new positions since the crisis are part-time. The study shows that more than half of workers “willingly” accept those jobs, while the remainder would like to work longer hours. As a result, wage growth has been subdued, helping sustain the pick up in employment. The study does point to a longer-term problem though. Unlike in the U.S., productivity in the euro area is still broadly at the same level it was pre-crisis.